The Emperors clothes of Waterproof LED ribbon tape! 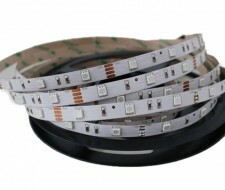 A new Nano waterproof LED strip light is ideal for applications where space is tight. Its appearance is identical to non-waterproof LED ribbon tape but it is sprayed with a substance to make it IP65 waterproof! Supplied on a 5m reel - it cannot be cut. All our non-waterproof LED ribbon tape can be supplied with this finish, please call our sales team for further information - 01492 233002.